On a May Wednesday in 2000, a room full of geniuses lost their jobs. Looking Glass Studios closed its doors and put the industry’s best minds on the streets of Cambridge, Mass. Not letting them take it sober, a sympathetic fan located a nearby liquor delivery service and ordered cases of Sam Adams for the office. As the bottles tipped, the phones lit up with calls from prospective employers. As the Looking Glass family enjoyed its last hours together, the vultures gathered to partition the spoils. It didn’t make sense. How did a creative dynamo get shut down at the height of its powers? We’ve already discussed the commercial failure of Looking Glass’ critically-adored titles like System Shock and Terra Nova: Strike Force Centauri. The studio proved itself as an innovating force. It just couldn’t turn a dime. That changed with the Thief series. Thief: The Dark Project and Thief II: The Metal Age married, at long last, high concept and profitability. Both games enjoyed respectable tenures on the bestseller lists. It seemed like Looking Glass was getting the commercial traction it had long needed. And then they were gone. Many blame Daikatana, a burgeoning failure of an FPS developed by John Romero. Romero was the first “celebrity developer,” and Eidos Interactive saw something profitable in his ridiculous hair and equally ridiculous resume – he was a lead developer on Doom, Quake, Heretic and HeXen. 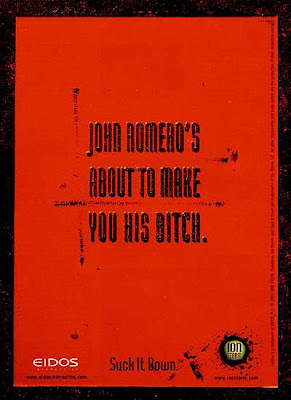 In 1997 his Austin, Texas-based Ion Storm was developing Daikatana, which Romero tauted as epic, fast-paced, and most importantly, done in time for Christmas ’97. Eidos gladly agreed to release the game. Looking Glass was developing a game set in medieval England, and who knew how that would sell? Romero’s game promised to make millions. Daikatana missed its original deadline, which is forgivable. It missed its next, which is less forgivable. And the one after that, and so on, extending a torturous development marred by disastrous demos, unexpected setbacks and staff shuffles. It had to end sometime, and it did: somehow, after three years, Daikatana was prepared to ship in April 2000. But the game was already doomed. Valve published Half Life in 1998, setting the bar impossibly high. When reviewers finally got their hands on Romero’s supposed capolavoro, they were shocked. It was bad – not only unworthy of the time, money and energy invested, but bad bad, by anyone’s standards. Eidos had invested more than $30 million in its gestation, and it would be lucky to see half of it returned. Theif II was selling well, but not well enough. Forget about day-to-day operational costs – paychecks were barely being paid. Belts were tightened, new budgets proposed, and the numbers kept coming up red. Looking Glass submitted a buyout plea to Eidos’ London headquarters, with backing from the publisher’s stateside division. Eidos had long intended to buy Looking Glass, but ultimately, the bank wouldn’t loan the cash, and the acquisition fell through. With no publisher, the studio folded. Eidos tried. They sustained the studio’s burn rate for months of development, and in the estimation of several Looking Glass employees, they were generous patrons. But the numbers kept turning up red. “We ended up ... spending the company's sanity and morale by throwing together this thing so [Eidos] could have a product in that quarter, when Ion Storm hadn't shipped a product in all that time. While Daikatana was busy not shipping, and while they were writing blank checks to John Romero to do Daikatana ... they told us basically to ship [Thief II] by their fiscal quarter or die." Tim Stellmach, lead designer, gave the publisher more credit: "I don't know what Eidos could have or would have done if circumstances were different,” he said. And Romero, seldom unheard, sturdily acquits himself and Ion Storm: "Our studio is linked with Eidos on an exclusive, multiproduct deal and they are also a major shareholder," says Romero. "It is impossible to draw direct parallels between the studios." Perhaps as a byproduct of narrative, Romero ends up as the monolithic villain. True, a more punctual publication/death of Daikatana would have helped Looking Glass, but it alone would not be enough. The industry was moving in a different direction – as Au points out, Raven’s brain-dead shooter Soldier of Fortune scaled the charts not weeks after Looking Glass cleared out of Cambridge. James Sterrett of ThroughTheLookingGlass.com wrote a comprehensive postmortem on the studio’s demise. As he stresses again and again, no single knife killed Looking Glass; instead, it was a confluence of blades, each striking at the worst moment. Those inclined towards apocalyptic ranting took Looking Glass’ death as an opportunity to predict the imminent decline of PC gaming (for the uninitiated, this happens every time a smaller studio goes under, gets gobbled by EA and dissolved, or willingly sells out). True: I will never see Terra Nova 2. But Ken Levine and the people at 2K (Ahem, 2K Boston) essentially remade System Shock 2 in Bioshock – which, in securing critical and commercial success, scored a poignant moral victory for its parent game. With the success of Bioshock, we may yet see System Shock 3. The flame of Looking Glass has been divided, but not diminished.